I've just finished Wainwright's Coast to Coast walk (WC2C). 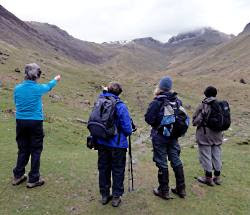 The 200-mile trod from St Bees in Cumbria to Robin Hood's Bay in Yorkshire is the most popular long-distance walk in the UK, and deservedly so: 10-15 days of mediumly challenging routes through stunning scenery in the Lakes (right), Dales and Moors. And quite a few bogs. Because, though it was a fabulous experience I thoroughly enjoyed and am delighted to have done, I prefer doing it by bike. I realised it especially here (right), on the Cleveland Way entering the North York Moors, when I enviously saw these guys trundle past, and get to the pub two hours before me. Sure, you lose some of the footpath-solitude on a bridleway/road route, unless you're a very adventurous offroad trekker. But the WC2C is pretty busy anyway: it's often hard to escape your fellow walkers (particularly, for some reason, mad middle-aged Dutch women who keep angling for your email address). And on a bike it's far more practical: you can do it in much less time, three or four days, and still get a wonderful - and blisterless - experience. Walkers get punctures too; they're just patched with Elastoplast and Compeed rather than a Halfords repair kit. I know this because I've done several biking Coast to Coasts now. 'The' C2C is the Sustrans Whitehaven/Workington to Newcastle/Sunderland route, though there are several others. 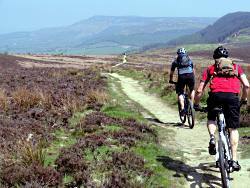 These include Hadrian's Cycleway, the Reivers, and the recent Way of Roses Route, from Morecambe to Bridlington. All very enjoyable, doable in that long-weekend slot, and plied by charity-fundraising teams who can't quite believe that you're just doing it for fun. 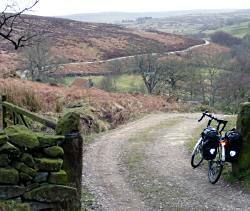 But my favourite was the Ravenglass to Ravenscar bike route I did shortly before walking the WC2C (whose track it roughly parallels). This isn't an official route, just something I made up on a whim - coastal opposites both beginning with 'Raven', and both at the end-ish of an Esk Valley. Which is exactly what Wainwright intended. His route was planned as a model of how to devise your own route, not a walk to be followed exactly. He'd be thoroughly dismayed to see the hordes dutifully following his exact trail, guidebook in hand, looking for a nice man to take back with them to Eindhoven. 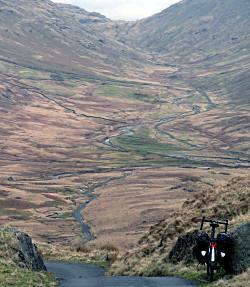 I had three days of glorious cycling: one in the Lakes (including the three-biscuit ascent of Hardknott Pass, above right); one in the Dales (including Buttertubs Pass and breathtaking Swaledale); and one in the Moors (bottom right). So yes, the WC2C is a lovely thing and I heartily recommend it. But for me cycling's still much better. No problems having to go an extra mile or two at the end of a day to find accommodation or a pub. Virtually no luggage weight limit, so you can take luxuries such as deodorant as well as necessities such as laptop. And mighty range that makes your investment of time-off (or, in the case of most WC2Cers, their pension fund) go that much further. And - the thing I miss most of all when I walk - those life-affirming, shout-for-joy freewheels downhill. Straining the knees to walk down the side of a fell feels like you've saved up only to get a whoppingly negative interest. Which reminds me of my pension fund. And for the less adventurous, the Cornwall Coast to Coast cycle route which you can do their and back in a morning! Ah we have fond memories of Ilfracombe. We knew what sort of place we were in when the welcome pack in our room contained information on how to get around town by mobility scooter, and there was an emergency pull cord above the bath. The Victorian private beach is, though, very well worth a visit. The Cornwall "mineral tramway" C2C looks a nice route. The fact that it is quite short is probably just as well: I wouldn't want to be riding on that loose compacted limestone surface for very far. Truro? Penzance, methinks. And Nigel too - this autumn?